Sinusitis: do I need antibiotics? Sinusitis is a common infection after a cold or flu and is usually caused by a virus. Symptoms include pain around the eyes or cheeks, a blocked nose, headaches and a temperature. People usually get better within 2 to 3 weeks without antibiotics. Your sinusitis will normally get better within 2 to 3 weeks whether you take antibiotics or not. Only about 10 out of every 100 people with sinusitis benefit from an antibiotic and the benefit is small. 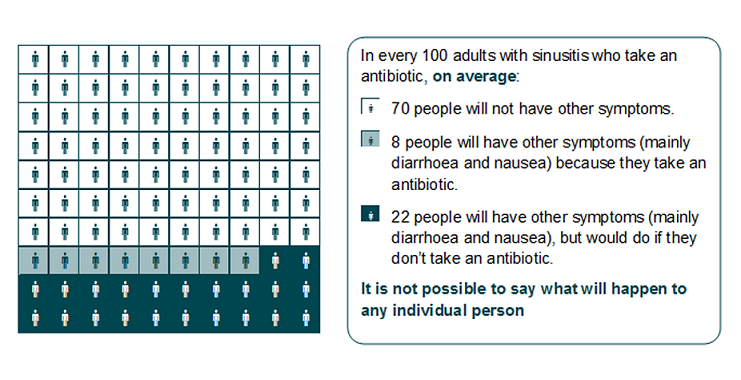 The chances of an antibiotic helping your symptoms are about the same as your chances of getting side effects like nausea and diarrhoea. Talk to your local pharmacist about other ways to help with symptoms, such as taking painkillers. You may like to try nasal decongestants or cleaning the inside of your nose with saline solution, although not enough research has been done to prove that these treatments work. You will be prescribed antibiotics if you need them, such as if you are very unwell or are at risk of complications. In some cases the prescriber may talk to you about a back-up antibiotic prescription. You can use this to get an antibiotic if you don’t start to feel better after a few more days, or start to feel worse. 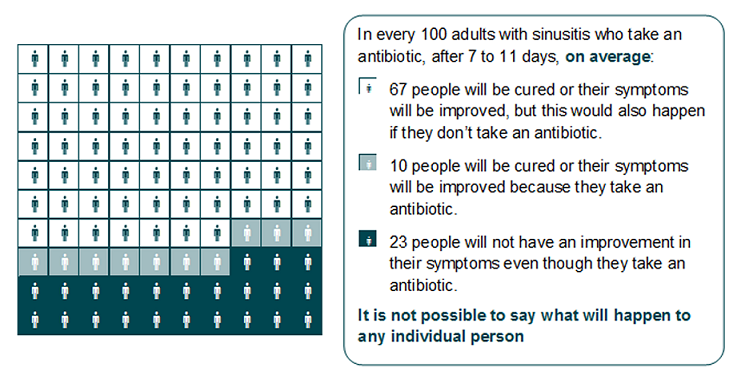 The diagrams below show information from a study that looked at what happened to people who took antibiotics for sinusitis and what happened to people who didn’t. NICE is advising healthcare professionals to tell their patients that a sinus infection will likely clear-up without antibiotics and that there is little evidence oral decongestants will help to relieve their symptoms.